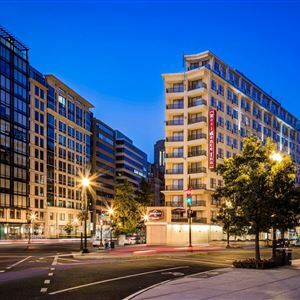 Property Location A stay at Residence Inn by Marriott Washington, DC Downtown places you in the heart of Washington, minutes from Franklin Square and close to White House. This hotel is close to Ford's Theater and George Washington University. Rooms Make yourself at home in one of the 202 air-conditioned rooms featuring kitchens with refrigerators and stovetops. Wired and wireless Internet access is complimentary, and flat-screen televisions with cable programming provide entertainment. Conveniences include safes and desks, and housekeeping is provided daily. Amenities Enjoy recreation amenities such as a fitness center or take in the view from a terrace. Additional amenities at this hotel include complimentary wireless Internet access and a television in a common area. Dining You can enjoy a meal at a restaurant serving the guests of Residence Inn by Marriott Washington, DC Downtown, or stop in at a snack bar/deli. Meet other guests and eat at a complimentary reception. Business, Other Amenities Featured amenities include complimentary wired Internet access, a business center, and limo/town car service. Planning an event in Washington? This hotel has facilities measuring 1,175 square feet (0 square meters), including meeting rooms. A stay at Residence Inn by Marriott Washington, DC Downtown places you in the heart of Washington, minutes from Franklin Square and close to White House. This hotel is close to Ford's Theater and George Washington University. Make yourself at home in one of the 202 air-conditioned rooms featuring kitchens with refrigerators and stovetops. Wired and wireless Internet access is complimentary, and flat-screen televisions with cable programming provide entertainment. Conveniences include safes and desks, and housekeeping is provided daily. You can enjoy a meal at a restaurant serving the guests of Residence Inn by Marriott Washington, DC Downtown, or stop in at a snack bar/deli. Meet other guests and eat at a complimentary reception. Featured amenities include complimentary wired Internet access, a business center, and limo/town car service. Planning an event in Washington? This hotel has facilities measuring 1,175 square feet (0 square meters), including meeting rooms.